Now here is where you come in. Bead Up has offered an item for the winner -- can you spot it? 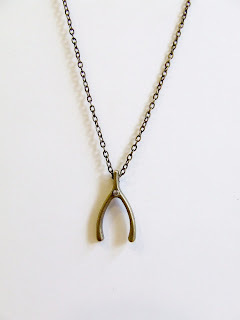 Since we all don't have shops, I am going to give away an additional wishbone necklace (in either silver or brass, winners choice!) based on those of you who vote for Bead Up's Etsy shop and blog! To enter, visit The Lovelies nomination site and post a comment on the Bead Up entries (click here and here to enter!) to nominate Bead Up for the Lovelies award. I will choose a winner from the entries on The Lovelies website at the end of the month! Thanks for participating and supporting Bead Up! wanted to let you know I am having the fundraiser/raffle and using some of the jewelry you sent!! WIll save the rest for the next one. I SO appreciate your williness to help. Thank you!! Your jewelry is beautiful! I've been making handmade jewelry for years and have just recently gotten in to selling on Etsy and exploring the blogging world. Always nice to be inspired by other artists!